Metallics are having a moment so I wanted to show you these two stunning silvers that recently landed on the desk at Fluff and Fripperies. First up we have the gorgeous Fit For A Queen, one of four new shades from Ciate’s latest Heritage collection. I’ve painted one entire hand with this, so you can get the full benefit of its sparkly, shimmery ways. There’s a touch of warmth to this, and a creaminess, and more than a hint of Chanel’s Graphite, too. On my other hand, I’ve alternated this with Mercury Metal from the Avon nailwear pro enamel range (€8), released as part of the brand’s Holiday Sequins & Shine collection. You can see that this is a really cool-toned, steely shade of silver – it’s a true metallic, super shiny and with none of the shimmer of Fit For A Queen. 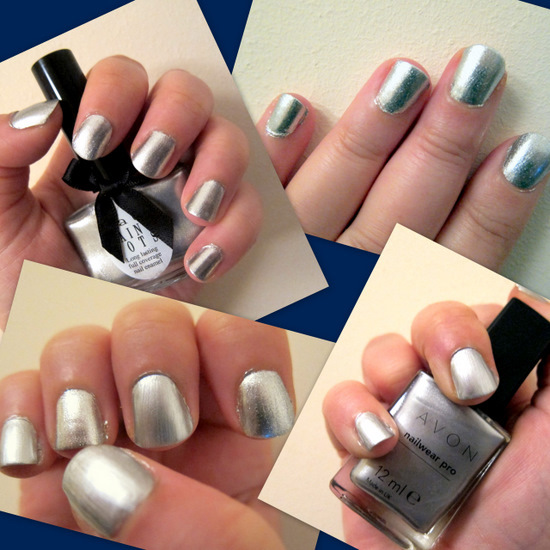 Both polishes were three-coaters, but worth it for the end result: perfect party nails! Fit For A Queen is priced at €10.50 and can be ordered here; Mercury Metal can be yours for €8 from your local Avon representative (find yours here). Are you feeling the metallic trend this winter? love the look of the avon one!